Orenthal James “O.J.” Simpson was born on July 9, 1947 in San Francisco, CA. He graduated from Galileo High School in 1965 and went on to play for two years at the City College of San Francisco before transferring to the University of Southern California (USC) for his junior and senior seasons. Simpson led the nation in rushing in each of his two seasons at USC, with 1,543 yards and 13 touchdowns in 11 games in 1967 and 1,880 yards and 23 touchdowns in 11 games in 1968. He earned Consensus All-American and Walter Camp Player of the Year honors both years, finished second in Heisman voting in 1967, and won both the Heisman and the Maxwell Award in 1968. USC won the Rose Bowl and the national championship in 1967; they finished fourth in the AP rankings in 1968. ​When Simpson retired in 1979, he was second in career rushing yards behind Jim Brown; today he is twenty-first. He led the newly merged NFL in rushing four times (1972, 1973, 1975, 1976) and finished third in 1974. 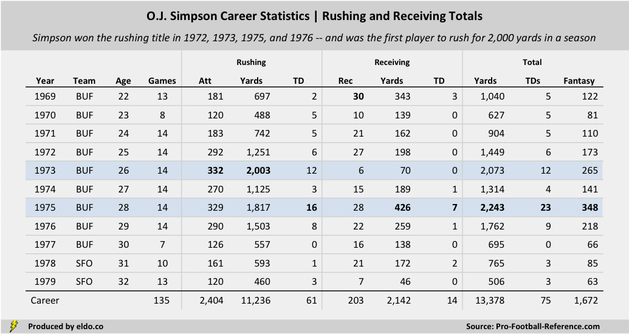 In 1973, Simpson became the first player to rush for 2,000 yards – he is the only player to do so in a 14-game season. 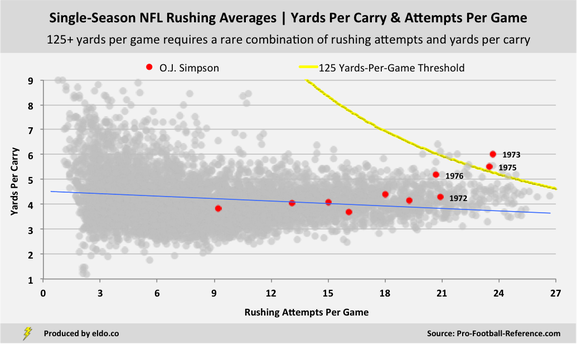 And if we consider yards from scrimmage and touchdowns, 1975 was even better for O.J. Simpson. 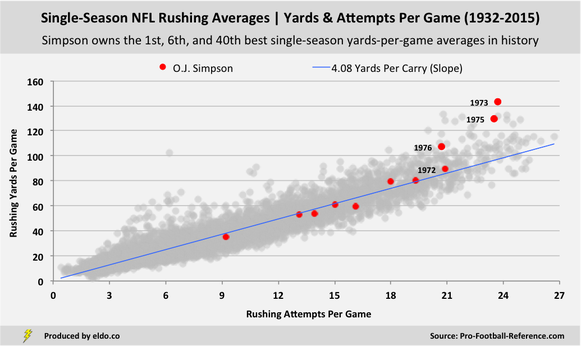 In rushing for 2,003 yards over 14 games in 1973, Simpson averaged 143 yards per game, still the best single-season yards per game average in NFL history. In registering 2,243 yards from scrimmage over 14 games in 1975, Simpson averaged 160 yards per game, second only to Priest Holmes in 2002. For recent context, consider how good DeMarco Murray and Le’Veon Bell were in 2014. In 1975, Simpson matched their historic yards from scrimmage totals - 13th and 22nd all-time, respectively - in two fewer games. Per game, Simpson was around 20 yards and almost a full touchdown better than both of them. Football Reference’s Approximate Value statistic places O.J.’s 1975 season in a second-place tie for best all-time by any player at any position. ​The 2,000-yard club has seven members: Simpson (1973), Eric Dickerson (1984), Adrian Peterson (2012), Jamal Lewis (2003), Barry Sanders (1997), Terrell Davis (1998), and Chris Johnson (2009). But judging single-season rushing performances by way of total yards isn’t so fair when the league(s) played only 12 games from 1947 through 1960 and only 14 games from 1961 through 1977. Let’s instead consider the “125 yards per game” club, as 125+ yards per game equates to 2,000+ yards over the course of a 16-game season. In doing so, Jim Brown (1958, 1963), Walter Payton (1977), and Earl Campbell (1980) join the party, and Simpson (1975) gets a second spot on the list. 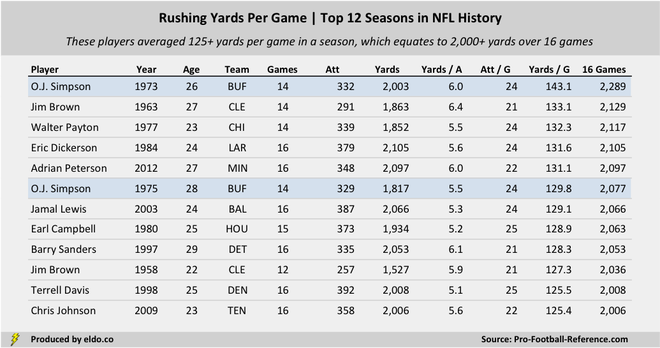 In total, 10 players have rushed for 125+ yards per game in a season, 12 separate times. O.J. Simpson (1st, 6th) and Jim Brown (2nd, 10th) are the only two players to do so twice. As you review the list above, you’ll notice impressive yards per attempt averages and heavy attempts per game workloads. Brown achieved 125+ yards per game most efficiently in 1963, averaging 6.4 yards per carry, followed by Sanders (6.1 in 1997), Simpson (6.0 in 1973), and Peterson (6.0 in 2012). The chart above maps rushing yards per game (y-axis) as a function of rushing attempts per game (x-axis), with league-wide yards per carry represented by the blue trendline. Simpson’s now-familiar 1973 and 1975 campaigns stand out as the first- and sixth-best yards-per-game performances in NFL history. His 1,503 yards over 14 games in 1976 looks superb here too – at 107 yards per game, it’s the 40th best single-season yards-per-game average in history (for rushers with a minimum of 150 attempts). This is no mathematical revelation, but running backs need a lot of yards per carry on a lot of carries to rush for a lot of yards per game. To hit that magical 125 yards-per-game threshold, you need the likes of 5.21 yards per carry on 24 carries per game, or 5.95 yards per rush on 21 rushes per game. To get that many carries and run so efficiently is rare – hence our list of only 10 players and 12 instances. Over the course of NFL history, a player has averaged 24+ rushes per game 32 times. Only four – the four with the most yards per attempt (Payton ‘77, Lewis ‘03, Campbell ‘80, and Davis ‘98) – ran efficiently enough to average 125+ yards per game. Meanwhile, 23 players have averaged 5.95+ yards per attempt on 9+ carries per game. Only four of them – here the four with the most carries per game (Simpson ‘73, Peterson ‘12, Sanders ‘97, and Brown ‘63) – broke the 125 yard-per-game barrier. This chart is perhaps the most telling with regard to Simpson’s career. O.J.’s 1973 and 1975 seasons soar high across the top, but if you look horizontally across the middle, you’ll see relatively few red dots. Beyond those two all-time performances, Simpson had but one excellent season (1976) and two very good seasons (1972, 1974). He ran well in 1977 but played only seven games. 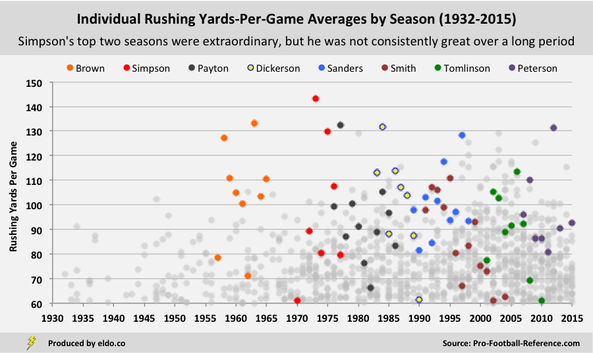 Payton, Dickerson, Sanders, and Peterson only managed to match Simpson’s second-best single-season performance once apiece, but they each boast another six to nine very good or excellent seasons. 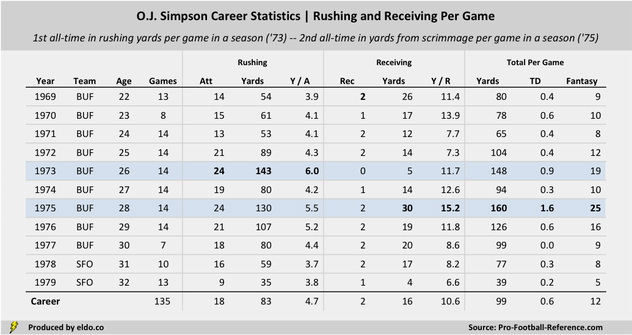 The best single seasons from career rushing leaders such as Emmitt Smith (1st all-time), Curtis Martin (4th), LaDainian Tomlinson (5th), and Jerome Bettis (6th) were only as good as Simpson’s third-best season, but they delivered sustained greatness over long careers. ​ Gale Sayers (6.2 yards per attempt on 15.3 rushes per game in 1968), Joe Perry (6.1 on 14.4 in 1954), Jamaal Charles (6.4 on 14.4 in 2010), Bo Jackson (6.8 on 11.6 in 1987), Mercury Morris (6.4 on 11.6 in 1973), Beattie Feathers (8.4 on 10.8 in 1934), and others can claim they too might have broken 125 YPG with more carries. But yards per carry (YPC) is a different animal, and we don’t want to “what if” our way into looking only at that metric, or multiplying YPC by some cooked-up carries-per-game number. We’ll address it again in the appendices, but it’s not the purpose of this exercise.